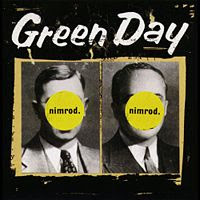 Nimrod adalah album kelima oleh band punk rock, Green Day, dirilis pada 14 Oktober 1997 oleh Reprise Records. Albumnya sendiri meraih Double Platinum serta menduduki peringkat #10 pada peringkat Billboard US lewat hitsnya, "Good Riddance (Time of Your Life)." So take the photographs and still frames in your mind. Hang it on a shelf of good health and good time. Tattos of memories, dead skin on a trial. For what its worth, it was worth all the while.